It's the Bat suit that makes the Batman. This week on PopMatters, I’m bummed out by Batman. 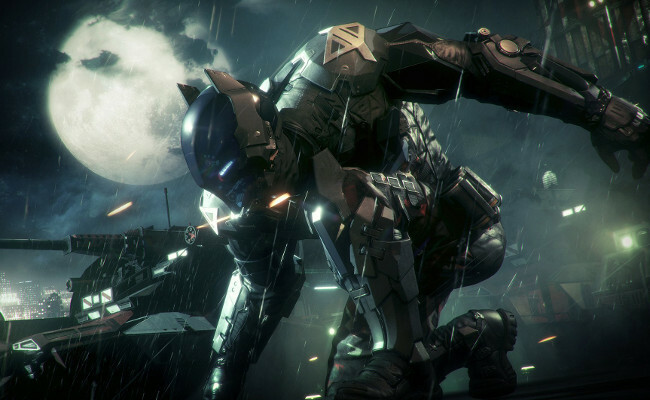 What is Batman: Arkham Knight supposed to be? There’s a very pronounced story that goes in some very dark places. At the same time, there are straight-up VR missions scattered across the open world that are meant to foster competitive leaderboards. There’s certainly plenty of fighting and most pivotal junctures revolve around brawls, but then you are thrown into extended racing and car-combat sequences. Batman is held up as a moral paragon for not killing anyone, but he’s also a huge meathead that basically grunts at all his friends while maiming any street thug he can get his gloves on. It’s feels muddled, and not in a good way. Core parts that made Arkham Asylum such a phenomenon are still present, they’re just buried under a extraneous open world cruft and a strangely-prominent driving mechanic. I know the Batmobile is a dividing line, but I have to engage in the flame war for a minute: In a game where you can pretty much fly, I can't really see why you would want to spend any more time than necessary on the ground. Additionally, it seems like the fact that you can turn it into a tank with 360 degree mobility an acknowledgement of how limited and squirrelly the normal driving is. There are definitely some highlights (mostly thanks to Mark Hamill's outstanding Joker performance), but overall I came away disappointed. Ironically, I probably would have given it more of a pass if it were some generic open world game. If that were the case, the mish-mash gameplay and classic video game protagonist douchery wouldn't have seemed so out of place. Instead, I got something that looked like Batman, but felt like an impostor.